Mountain resorts are an occasionally unerring type of destination. They represent the most straightforward ways, on paper, of accessing the prime mountain country of any given destination. But the flip side of that is that they can appear austere and inauthentic tourist centres, full of people milling around but not actually knowing how to inject life into their trip (or people content in just milling around: fine if you fit into that category but then this probably isn’t the article for you!). Starý Smokovec can be like that. Its age-old charm (it was, after all, the original mountain resort here, dating back to the late 19th century) ensures it is the suavest place to stay in these parts. There are some very decent restaurants around too. Yet it as neither as obviously in the mountains as Štrbské Pleso (where it’s more apparent how to at least get up to the namesake lake for a flavour of the surrounding Alpine scenery), and has less to do than Tatranská Lomnica (where a good museum and the cable car ride of the country, up to Slovakia’s second-highest peak, Lomnický štít, await). The bottom line is that if you are just-arrived in Starý Smokovec and want to get up towards the tops of those peaks looming above your guesthouse or hotel window, 19th century architecture and nice places to eat will not divert your attention too long. From the Tatras Mountain Railway station (with direct connections from Poprad’s mainline railway station every hour), it’s a couple of blocks’ walk up to the funicular railway station to Hrebienok, via this route. Taking the funicular up to Hrebienok is the sure-fire way to get up and into cracking mountain scenery quickly. It’s one of the few funicular railways in the Slovak mountains (most transport up into the peaks is by cable car or chair lift). The regularity of the Starý Smokovec-Hrebienok connections also means this is a plausible half-day trip (time for a bite to eat in the Hrebienok funicular station restaurant and a stroll around). For the 8-minute trip up to Hrebienok, you’ll part with 8 Euros one-way or 9 Euros return trip, with daily trains leaving on average half-hourly between 8:30am and 4:30pm (in the summer season between June 1st and October 1st, 7:30am to 7pm). (In February trains only run at weekends and in March just Monday through Friday). A block below this joint, it’s turn-of-the-century grandeur and tourist crowds often being served unexceptional food; here it’s the far-more Slovak pine and beech wood chalet-style with spotted and chequered tablecloths garnished by fresh flowers. A beaming Kamzík (mountain goat) welcomes you into an outside eating area and subsequently an interior that sparkle with chirpy decoration (the šupulienky cockerels steal the show). The service is speedy, if a tad abrupt (which is a lot better than lackadaisical and abrupt) and this means you’ll be sitting down with your choice from the classic but brilliantly executed Slovak menu in the pleasing and peaceful surrounds all the sooner. What to choose? (you’ll probably have to fend the waitress – she’ll be clad in traditional Slovak folkloric dress, by the way – off a couple of times). Soup, that quintessential way of embarking on a Slovak meal, is a worthy starter. I went for the hríbová polievka (mushroom soup) but the cesnaková polievka (garlic soup) looked like it tasted equally delicious. Soups with meals in Slovakia are generally thin, with the key ingredients not totally blended in but bobbing in tasty bite-sized morsels within, and rich in taste: mine was no exception. My choice of main was the “koliba plate” involving hearty amounts of dumplings (two kinds, the pirohy which are more like parcels containing meat, and halušky, solid dumplings cooked in bryndza sauce) and Slovak spicy sausage, klobasa. Venison, beef and an incredible grilled trout also flank the menu. And perhaps here comes the deal maker. A proper Slovak eatery, rather than one of its pale imitations, is one thing. One that embraces Slovak food and does it with aplomb is another thing. The view (from the restaurant interior, if you grab a window seat, you’ve got the resort of Starý Smokovec ushering in a view down the hill slopes into the wide valley between the High and Low Tatras massifs) is a third thing. That all this comes together in such a touristy locale makes it four things. But the fifth thing trumps the others: the price. The mains start at a mere 5.50 Euros, and the grilled fish is only 8.50 Euros. You are saving money by coming here, and harbouring the feeling that, in the midst of all those tourists, you’ve somehow thwarted the tourist traps. So. Come! LOCATION: Starý Smokovec 8 (Starý Smokovec is the road which rises up behind Penzion Tatra (itself looming up above the Starý Smokovec mountain railway station) and you’ll see the big sign looking to the right as you head up this lane.) The website gives you a fuller idea of the menu (if you can read Slovak). OPENING: 11am to 10pm daily. Zamkovského Chata is your recommended stopover between stage 2 and 3. This is a long day’s walk: you should allow 6.5 to 7 hours all told. Down and over a river and it’s the forest track heading uphill that you want; this climbs to a noticeboard then heads straight on (it’s even paved in places) heading slightly down overall to get to Hrebienok. Here the path skitters round the Hrebienok outbuildings (there’s a chata here, Biliková Chata, where you can stay) then cuts uphill through forest which took a beating in the spring storms this year towards Sliezsky Dom. Allow 2 hours to reach Sliezsky Dom from this point. The path from here continues up around the back of the hotel and from here it’s still a tough 3.5 hour hike to Horský Hotel Popradské Pleso. You’re very soon up in wild moorland here, and back up above the snowline for large stretches. In its bleakness, however, this stretch of the path is beautiful and otherworldly: just leave enough time to enjoy it and if you’re running out of light or if the weather is bad DO NOT attempt the final descent down to Horský Hotel Popradské Pleso. There is a bad weather option in addition, as detailed below. The trail, marching along a specially constructed path of boulders, as it has at various points thus far, meets a yellow trail coming up from the access road to Sliezsky Dom after 30 minutes of hiking. After the junction, the path ascends very steeply into perhaps the most daunting landscape of the entire hike: the icy locale of Batizovské Pleso, where the water gleams an ethereal ice-blue and the boulder-strewn surrounds are like a little snapshot of Siberia, juxtaposed onto the High Tatras. The route coasts up the right side of a vast U-shaped valley, with Batizovské Pleso at the top, hugs the contour as it negotiates the southern lakeshore and then arrives at a junction where, as stated before, you need to make a choice. From the junction of the red Tatranská Magistrala and the yellow trail (the one that goes down) it’s 2 to 2.5 hours onto Horský Hotel Popradské Pleso on the red route or 1 hour 45 minutes down to the tiny village of Vyšné Hágy on yellow. Of course, in an ideal world you would follow the red Tatranská Magistrala on to your stage 3 destination from here. The path is fine (although it does climb up to nigh on 2000 metres, so another 100 metres up from Batizovské Pleso) BUT then comes the demanding descent a good 600 metres straight down to the lake of Popradské Pleso. The official trail guide makes little of this descent and says it’s doable in 45 minutes. That may be true, but for those not used to the legendary Tatras chain descents (i.e. where you absolutely have to cling to a chain or you will fall in places) this is a formidable and vertigo-inducing path. Do not attempt the red route from this point onto Popradské Pleso unless you have at the least 2.5 hours of daylight left – and even then not from October to May when snow obscures parts of the descent. The alternative is in any case quite pleasant: an easy, although again extremely rocky, path down into pine forest (it follows a river for a while which is intense in spring and winter) to Vyšné Hágy which has no accommodation but does boast a sports pub and a stop on the High Tatras mountain railway between Poprad/Starý Smokovec and Popradské Pleso/Štrbské Pleso. Keep to the red trails through the forests, descend to a farm where an inordinate amount of tractors seem to park, then cross the mountain railway line and bear left to ascend again slightly to the station. It’s then one stop on the line to the isolated Popradské Pleso station and the much-easier one hour hike back up to Popradské Pleso and Horský Hotel Popradské Pleso (on a blue trail). When you get to Popradské Pleso there are actually two accommodation options right next to each other on the western shore where the road ends: Horský Hotel Popradské Pleso and another chata right next to it, which is by all accounts very nice too. It’s time for a plate of dumplings and possibly more than one beer: you’ve arrived. It was summer, but we were still rubbing our hands together to keep the circulation going whenever we had to remove our gloves to study the map. A cold wind was blowing belated flurries of snow down from 2500m peaks over the long, exposed, boulder-strewn stretch of the Tatranská Magistrala between the lurid mountain lakes of Zelené Pleso and Skalnaté Pleso, shaking the timbers of each man-made structure, hut to signpost, that it could find. Re-entering the pine forests after a long descent from these wild climes was for us a relief: a respite, if you like. It’s a particularly majestic stretch of forest: one that has survived the strong winds (a phenomenon known as the Tatranská bóra) that have plagued the high-altitude forests of the High Tatras for decades; one which feels as old as, or older than, the glam days of Tatras tourism in the late 19th and early 20th centuries. And it is here that we eagerly sought refuge in one of the most interesting accommodation options of the many dotted across these high mountains. Zamkovského Chata is one of the oldest High Tatras mountain houses: an expansive two-floor log cabin that resonates with history. Štefan Zamkovský, a renowned mountain guide and ranger, and one of the key figures behind the development of the High Tatras as a tourist destination, built the house between 1942 and 1943, lived there with his family, and let part of it out as a refuge from the weather for weary walkers. Despite his efforts for the local tourism industry, Zamkovský had his property confiscated in 1948 under the Communist regime (the house subsequently became named after one captain Nalepka) and it was only after 1989 that the lodge was returned to the Zamkovský family, and reassumed the name Zamkovského Chata. The story of Štefan Zamkovský is touchingly retold in the log cabin restaurant of Zamkovského Chata – which has become a museum of sorts to the development of tourism in the High Tatras (and a museum where you can slurp Slovak mulled wine and wolf down pirohy – great by us!). A one-hour walk up from the cable car station at Hrebienok (connecting tourists to the resort village of Starý Smokovec below) and a one hour walk down from Skalnaté Pleso (where another cable car connects tourists with the more easterly resort village of Tatranská Lomnica below), it is accessible enough for families and afternoon strollers to trek here for lunch, and close enough to the serious mountain hiking/climbing to act as a magnet for the outdoor adventure-obsessed. Its location is sedate and sheltered, in contrast to the other more exposed mountain houses out on the slopes, but at the same time, breaking through the gaps in the trees, are signs of the sheer rock faces close by. As if by way of reminder, the tough green trail spirals away from outside the chata, climbing from 1475m on the edge of the lodge grounds to Téryho Chata, the remotest mountain house at 2000m, in one hour and 45 minutes. But the lack of a cable car terminal means Zamkovského Chata still retains a blissful isolation; a Germanic “lost house in the woods” feel. Six 2-, 4- and 5-bed rooms above the restaurant offer beds for 23 people: if it’s full there is also an attic with several mattresses for bedding down if you have your own sleeping bag. It’s one of the High Tatras mountain houses that’s open year-round, too – and therefore the facilities (available information on nearby hikes, options of food in the restaurant – are better than at many other mountain accommodations. You’ll be charmed by it whatever the circumstances of your arrival. Hiking here from Zelené pleso in bitter weather on , it will seem nothing short of a cosy woodsy paradise. This mountain house is our recommended stopover between stage 2 and stage 3 of the Tatranská Magistrala, Slovakia’s most famous long-distance hiking trail that runs right across the High Tatras from Ždiar to Podbanské/Pribylina. MAP LINK: The remoteness of Zamkovského Chata means it’s not possible to get sufficient detail and useful nearby landmarks on one map. This map is zoomed to the level that shows where it is in relation to the Hrebienok cable car terminus; zoom in one level and the paths between the two and on up to Skalnaté pleso become visible. BOOK ZAMKOVSKÉHO CHATA: This is an extremely remote mountain house, without a regular internet connection,so booking is generally done by phone (or, if sufficiently in advance, email.) There may be a problem getting someone to speak English if you do telephone – although it is policy to usually have one English-speaking member of staff on duty at all times. Telephone 00421-(0)-905-554-471 (mobile). Email zamka@zamka.sk. It’s a turbulent collision of worlds, Skalnaté Pleso. The cut-off point between the lower slopes of the High Tatras mankind has succeeded in taming to some extent and the wild peaks rearing above that mankind (let’s hope) never will tame. Cowering just below the point where the mountains sheer away in broken walls of rock in a natural frontier, of sorts, between Slovakia and Poland, this windswept mountain lake is a place you should visit for any number of reasons. It’s connected by a gondola cableway (via Štart, a mid-station where you can disembark) down to Tatranská Lomnica one of the three main High Tatras mountain resort villages – from where there’s access via the Tatras Electric Railway to Starý Smokovec (mountain resort village number two) and then along to Štrbské Pleso (mountain resort village number three) or down to Poprad for mainline rail connections west to Bratislava and east to Košice. The train journey from Bratislava is beautiful, with the last hour or so to Poprad a sensational Central European montage of lakes and Alpine scenery (find out a bit more about why this journey is great). The final part of the route takes you from the valley bottom to the prettiest of the resort villages, Tatranská Lomnica, and then becomes increasingly dramatic as you rise out of civilisation onto the scree-strewn Tatras slopes, with the farmland around Poprad soon just a green gleam below. You’ll pay 1.50 Euros on the Tatras Electric Railway from Poprad to Tatranská Lomnica and 15/18 Euros single/return on the cableway from Tatranská Lomnica to Skalnaté Pleso (which is closed in May, incidentally, for maintenance, and obviously does not run in bad weather). 2: The Ultimate Cable Car Adventure! Most people arrive at Skalnaté Pleso via the gondola cableway from Tatranská Lomnica, and many want to come here for the more hair-raising cable car journey ahead. Supported only by a steel wire you can ascend from the lake up the precipitous slopes of Lomnicky Štít, Slovakia’s second-highest mountain, to the summit at 2630m high (just 20m shy of the highest mountain in Slovakia, Gerlachovský štít). Lomnicky Štít is Slovakia’s most-visited mountain thanks to this cable car route, a 26 Euro/22 Euro adult/child return journey with a 50-minute stop-off at the summit, where there’s a cafe and, in fact, the possibility of staying over in surely Slovakia’s plushest wilderness accommodation option, a sumptuous suite located within the summit weather station buildings. The meteorological station on the summit is one of Slovakia’s most important, and there’s an observatory here, too (if you’re staying in the suite – 549 Euros per night, mind you – star observation is included – as is dinner at the cafe). 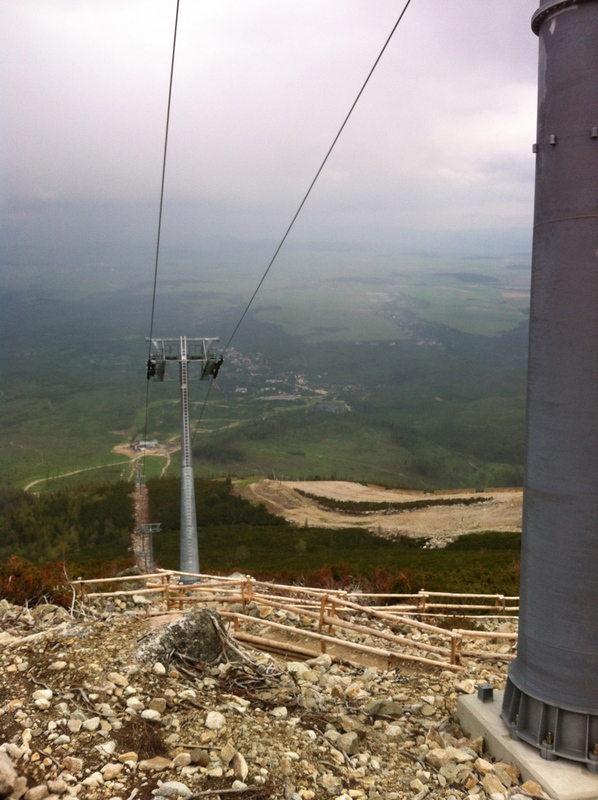 The Englishman in Slovakia will test the Lomnicky Štít cable car out soon, and write more about this adventure then. Skalnaté Pleso is an important stop-off on the Tatranská Magistrala long-distance path that runs across the Tatras between Ždiar and Podbanské/Pribylina. 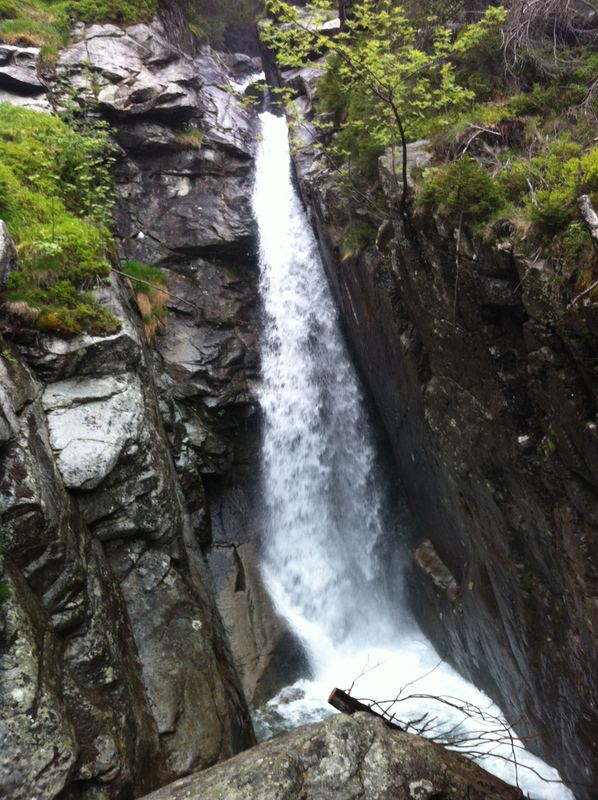 On this blog we feature a detailed breakdown of the hike (in four stages) – coming from Ždiar, you’re on stage 2 of the hike at Skalnaté Pleso. The section from the Skalnaté Pleso cable car station southwest to Zamkovského Chata is a good, rocky trail descending into woodland but yielding some wonderful views beforehand. Heading north on the path to Chata pri Zelenom Plese, however, be warned that there are two routes. The lower (and simple enough) path descends down the contours of the mountain on a round-about path to reach Chata pro Zelenom Plese (and Zelené pleso alongside) the easy way. The tough route is still part of the trail, but is strictly a summer-only route, ascending a dizzying pass through the mountains where, despite the chains laid down to cling on to, parts of the path are vertigo inducing, and very dangerous to attempt in snow. With the strong winds that whip off the peaks from here, Skalnaté Pleso is very exposed – none of the leafy sedateness of Štrbské Pleso here! – and chill you very well might on most days of the year. But should the weather be clement enough, the lake shore makes a good place for a picnic. A learning trail (naučný chodnik, in Slovak) enlivens the 20-minute stroll: here you can find out about the flora and fauna (a funny section on the bear residents hereabouts) and the Skalnaté Pleso meteorological station, located just above the shore. It’s a station of worldwide significance, with astronomical breakthroughs made here including important discoveries about meteor shower and crucial research for much of the content that appears in star gazetteers. The meteorological station, like the other buildings here, serves to heighten the remoteness of the location rather than lend the lake any atmosphere of cosiness. The wind buffets the brick and sings along the wires. In the cable car building is a restaurant, however (closed in May, open at other times) whilst just 100m down from here, on the trail to Zamkovského Chata, is the small Skalnatá Chata (open year-round), one of the High Tatras mountain houses, where you may stay over. There is something undeniably eerie about this lake, granted. The cable car which gives you the best access here also uglifies it somewhat, and it cannot compete in beauty with, say, Zelené pleso to the north. It’s also – inexplicably – shrinking in size: it used to be significantly wider and deeper. But if you want a departure from the magnificent but manicured shores of Štrbské Pleso into somewhere, well, closer to the wild soul of these mountains, and one where you can base yourself whilst you scale Lomnicky Štít, then it’s a great, and fairly otherworldly destination in the High Tatras. Ever since moving to Slovakia, hiking its most renowned mountain trail, which traverses the entire length of the Tatras mountain range, was something I had been obsessed with doing. The opportunity presented itself this weekend just gone with a friend (and fellow hiking enthusiast) out from the UK so this introduction to the hike and the posts that follow it on the stages of the walk itself are the most bang-up-to-date in-English info on hiking across the Slovak Tatras: online, or indeed anywhere else. In fact, the paucity of available online info is what has prompted me to write about this path. What is the Tatranská Magistrala? Essentially, the Tatranská Magistrala is a tough 42km hiking trail that runs from the White Tatras (the northeast section of the High Tatras) through the High Tatras themselves to the western edge of the Western Tatras. The White Tatras, High Tatras and Western Tatras mountains are all usually referred to by the umbrella term “High Tatras”. Seen from a distance, this relatively short but extremely impressive range of mountains in northern Slovakia seems to come out of nowhere: a jagged series of peaks reaching 2654 metres, the tops of which often remain snow-covered even in the summer months, rearing abruptly out of the green plains below. The hike takes in the very best of Slovakia’s mountain scenery – from pine forests to boulder-scattered ridges and ice-blue tarns. Officially the hike runs west-east, starting at the remote village of Podbanské in the foothills of the Western Tatras and finishing at the far-more remote lake of Vel’ké Biely Pleso on the cusp between the High Tatras and the White Tatras. However, given the remoteness of Vel’ké Biely Pleso (you will need in any case to hike on down to the nearest road from here), a far-better end point is the large, scenic village of Ždiar, below the White Tatras peaks at the eastern end of the mountain range. In fact, given the decent transport connections (buses to Poprad which is on the main Bratislava railway line and is now at the receiving end of a new flight route from London) accommodation options and loftier elevation (i.e. it’s less of a lung-buster to hike up to the high peaks from here) Ždiar is Englishmaninslovakia’s recommended starting point for the hike, and the route we have described here is from Ždiar. Meanwhile, Podbanské, despite being a gorgeous little village, has limited accommodation/transport options – and these are only available from the end of June to the end of October unless you’re a big group booking in advance. Therefore you will often need to make your way the 8km further west to the larger village of Pribylina to conclude the hike (from here there are ample accommodation possibilities and decent bus connections to Liptovský Mikulaš, a large town on the Bratislava main railway line). Practically, therefore, the Tatranská Magistrala is usually a Ždiar to Pribylina hike (almost 60km rather than the official 42km): and it is this hike which is described here. For this reason the trail has an official opening date of June 13th and closes at the end of October (as for the opening date, this is to a large extent immaterial as the afore-mentioned ice and snow is still on the higher reaches of the trail then, but temperamental weather means it really is dangerous to walk it after the closing date). In practice no one will prevent you from hiking it outside of the official dates, and late May through to the end of October should be fine for hiking it. Weather aside, the high point of the trail at the eastern end, Sedlo Pod Svištovkou (2023 metres high; above Chata pri Zelenom Plese and the lake of Zelené Pleso), is a tough and formidable climb at any time. The steep, slippery and often crumbling (the rock underfoot, that is) ascent will induce vertigo in many and is a serious undertaking: you have to cling to chains whilst pushing up precarious rock faces at a few points and strong gusts of wind from the top hardly improve balance. The other major factor to consider after high winds this May that brought hundreds more trees down (on top of the already destructive Tatranská Bora storm that devastated the same band of forest in 2004) is that beyond Štrbské Pleso heading west to Tri Studničky and Podbanské there are hundreds of fallen trees blocking the path. The priority for authorities after these storms was to clear roads and get access to the villages cut off. Still, the determined could forge a way through (we did, as far as Tri Studničky) but the path is currently out of sight at points just beyond Jamské Pleso, and fallen trees at Tri Studničky have made finding where the Tatranská Magistrala goes at all after the forestry chalets here extremely difficult (we tried for about an hour to find the path and failed). UPDATE 2016: The trail is now clear! d) Distances in Times not KMs/Miles! In Slovakia, all distances for hikes are given not in km but in the time any particular stretch of hike will take the average hiker (i.e. in hours and minutes, rounded normally to the nearest 5 minutes). I would say I’m of reasonable fitness with regards to hiking and I found that when walking with a medium sized pack the times given for High Tatras point-to-point destinations are incredibly accurate. With a push, you can beat the stated times – but only by a matter of minutes. Overall, giving distances in times is, I think, good because you know the on-the-day time you’ll need for the walk, which gives you a more realistic idea of gradients than a distance in km or miles would. The trail skirts high above the main High Tatras resorts like Starý Smokovec and Štrbské Pleso: so it’s just as well you don’t have to descend to get your evening meal or night’s sleep. Instead, there exists a very good network of mountain hotels (horský hotels, rustic hotels with ample rooms and good facilities) and slightly more basic chalets (chaty; usually wooden structures that provide basic rooms and, like the mountain hotels, good evening meals and breakfast). These are all found on the trail itself, so you’ll be well-poised the next morning to get up and walking again. In addition to these options, there are a few other choices en route (to be mentioned in the stage descriptions, have no fear), with the best choices at Štrbské Pleso (on the path) and at Ždiar (beginning of route) and at Pribylina (end of route). At a push, you could potentially walk from Ždiar to Zamkovského Chata in a day, on to Popradské Pleso next day and finish in Podbanské/ Pribylina half-way through the next day: doing the hike quicker than this is possible, but it would really be rushing it. Got the general idea? Now it’s time to go to our Tatranská Magistrala Hiking Kit List (complete with info on Slovakia hiking maps/apps), followed by our Tatranská Magistrala Stage Descriptions and our recommended High Tatras Mountain Houses (under the Places to Stay/High Tatras sub-section) which of course tie in with the Stage Descriptions. The electric trains that run between Poprad and the High Tatras mountain resorts are more than a means of getting about: they are an experience in themselves. I, being quite passionate about public transport, am a huge fan of a transport network that not only gets you from A to B but also does so via beautiful mountain scenery, and runs reliably throughout the day, every day. It’s something not all visitors would necessarily know much about and I have the selfish motivation that detailing the route/logistics also helps link up many of my posts on the mountains and makes them make more sense. So find everything you need to know about the route, known variously as the Tatras Electric Railway, the Tatras Mountain Railway or indeed in Slovak as Tatranská Elektrická Železnica below. From the mainline station of Poprad Tatry there are essentially three lines running: from Poprad via Starý Smokovec to Štrbské Pleso; from Starý Smokovec to Tatranská Lomnica and from Štrbské Pleso via Tatranský Liesovec to Štrba (at the mainline station of Štrba you change for the regular, frequent trains back to Poprad). This means that you can do a loop from Poprad up into the mountains (changing at Štrbské Pleso and then again at Štrba) and come down again a different way – all on this railway line. It’s the least complicated way of getting up into the mountain villages which are the base for all those exciting High Tatras activities (hiking, ice climbing, caving, skiing, whatever). Arrive in Poprad Tatry mainline station; walk up to the Tatras Electric Railway departure point, voila. Of course, there are also buses from the bus station quite near the train station, but the schedules take some finding and are not as dependable as the trains. The trains are also just as cheap: although no quicker and often slower in actual speed. For the journey from Poprad to Štrbské Pleso which is the maximum distance you can do without changing on the Tatras Mountain Railway tickets are 2 Euros one-way. The journey from Poprad to Starý Smokovec or Tatranská Lomnica (less distance) will be 1.50 Euros one-way. Štrbské Pleso to Štrba is only 1 Euro but if you want to go back to Poprad via Štrba it will be 2 Euros. Trains run more or less hourly on all three routes. On the Poprad to Štrbské Pleso route the first train is at 5:04am and the last at 22:40. Going back on this route, the first train leaves Štrbské Pleso at 5:13am and the last leaves at 22:13. The journey takes a shade over one hour. There are other connections you can take going via Štrba but only within these same hours. From Poprad on this same line you’ll reach the station of Starý Smokovec after 40 minutes, where you can change for the Starý Smokovec to Tatranská Lomnica route. On this route the first train is at 5:56am and the last at 22:02. Coming back on this route, the first train 5:14am and the last is at 22:34. The journey is only 15 minutes. On the Štrbské Pleso to Štrba route the first train is at 5:17am and the last at 22:44. Going back from Štrba, the first train back up to Štrbské Pleso is at 5:56 and the last at 20:26. The journey is again just over 15 minutes. If you’re a first-timer, you can buy your ticket at Poprad Tatry station in the main ticket office. You always have to remember to validate this ticket on board. Most other stations on all three routes also have ticket offices, and ticket machines (which accept Euro coins only). If you imagine a line with Štrba at the western end and Poprad at the eastern end and then – in the mountains above – Starý Smokovec almost parallel with Poprad towards the eastern end of the mountain range (and Tatranská Lomnica, indeed, further east) with Štrbske Pleso parallel with Štrba towards the western end of the mountain range. There: you hopefully have a picture in your head now. Starý Smokovec is perhaps the main mountain resort village (although Dolný Smokovec just before it also has decent accommodation). Still, it’s Starý that has most tourist facilities. Overall it has the feel of an old Victorian-era resort and a lot of it retains its old-world charm. Guesthouses, hotels and restaurants a-plenty. From Starý Smokovec there is a cable car up to Hrebienok where you can link up with the Tatranská Magistrala (Stage 3) an hour’s walk south of Englishmaninslovakia’s recommended stage 2/stage 3 stopover, Zamkovského Chata. Tatranská Lomnica (east from Starý as previously described) is another fairly pretty village with plenty of accommodation options. From here you can also take the cable car up to Štart and then onto Skalnaté Pleso at which point you are on the Tatranská Magistrala (Stage 2). At Tatranská Lomnica you can also get fairly regular buses onto the village at the very eastern edge of the High Tatras, Ždiar – which is where you can also start the Tatranská Magistrala hike. Heading west from Starý Smokovec there’s a few more stops which are of no major interest to the majority of visitors (except as start points for hikes – but there’s too many of those to detail here) before arriving at Vyšné Hágy, where there’s a back route to link up with Tatranská Magistrala (Stage 3, but little else besides a sports pub. The next stop on is remote Popradské Pleso (read our additional post about Popradské Pleso here*) but, despite the name of this station, it’s still a one-hour hike from here up to the lake and lakeside hotel, Horsky Hotel Popradské Pleso (see a description at the end of Tatranská Magistrala (Stage 3) about this route and yet more about Popradské Pleso and its surrounds on Tatranska Magistrala (Stage 4). The final stop on the Poprad to Štrbské Pleso line (Štrbske Pleso unsurprisingly) is one stop further beyond Popradské Pleso. It’s the least appealing of the mountain resort villages. The lower parts around the train station have been destroyed a tad by development (although there’s a great cafe-restaurant here, Furkotka – I’ll write about it some day) but up by the lake it’s still a very serene and beautiful place. There are several hotels here and of course the ski developments. In the High Tatras, Štrbské Pleso is probably the best – or at least the most popular – place to ski. Read more about Štrbské Pleso as it features on the final stage of the Tatranska Magistrala (Stage 4). You may well not be in Štrbské Pleso for the hiking and therefore we have additionally prepared this fascinating article on what else there is to do at Štrbské Pleso (a fair amount). All in all, though, imagine it: this is a commuter train, that ushers you up to some superb mountain getaways. And for a couple of Euros. MAP LINK: This map shows the whole network of routes: remember, Poprad, Štrbské Pleso and Tatranská Lomnica are the three extreme points. NEXT ON THE JOURNEY: We’ve said it here already and we’ll say it again: the end of the line on the railway is Štrbské Pleso – great access to the high peaks from here! RELATED POST: London to Poprad Flights Are Flying!